Do you ship Xerox Phaser 6000 toner to India? How long will the shipment take to arrive in India? I've already bought some cartridges from you for my Xerox WorkCentre 6015. I noticed that the cartridges were actually for a Phaser 6000 / 6010. They seem to work perfectly well, but before I buy another two sets I would just like confirmation that these will work - I want to be sure I'm ordering the right thing? Many thanks, Andrea. The Xerox Phaser 6000 is able to print as many as 30,000 pages per month to keep up with the demands of most workgroups. Colour and monochrome printing capabilities make the Xerox Phaser 6000 a more sensible choice for offices that need a versatile laser device. However, it does not offer competitive print speeds, as the Xerox Phaser 6000 laser printer can only produce about 12 pages per minute. Warm up time takes about 14-17 seconds. The Xerox Phaser 6000 colour laser printer is a compact addition to any computer set-up. It measures only 15.35x12x9.2 inches and has maximum paper capacity of up to 150 sheets. The Phaser 6000 has a 1200 dpi print engine capable of producing good quality text and even images. It supports different types of media, with a maximum size of up to 8.5x14 inches. The Xerox Phaser 6000 colour printer does not have automatic duplex capabilities, but double sided printing can be done manually. Its small frame and high-volume capacity makes the Xerox Phaser 6000 compact desktop colour printer a good choice for smaller offices. It is a basic colour laser printer with superb quality outputs and acceptable print speeds. 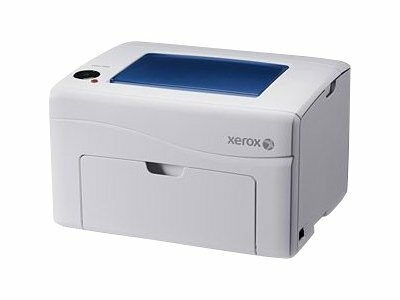 The Xerox 6000 Phaser also operates quietly and paper handling is very convenient, thanks to the unit's convenient design. Toner for the Xerox Phaser 6000 is quite cheap and compatible Phaser 6000 cartridges made from using recycled materials have also been released onto the market. The Phaser 6000 cartridges have low print yields, though. The Xerox Phaser 6000 compact colour printer still cannot compare to speedier units, since it can only print 10 full-colour pages and 12 monochrome pages per minute.